Philippine Railway Historical Society News and History! : Tayuman/Tutuban 2007 Photo Essay! A recent enquiry about structures in Tayuman and Tutuban by Jeffrey Tamani enticed me to do a photo survey on the group for the benefit of him and others. Jeffrey is urgently looking for an actual track diagram of the entire area for a model railway he is building. This will be a mammoth undertaking and one I look greatly forward to featuring on this blogsite in the future. If anyone is able to help him please contact this blogsite. The essay will proceed over the next couple of weeks as I locate shots that will be of interest. Signalling, structures, trackwork etc. Most were taken during my 2007 and 2004 trips, but next to nothing has apparently changed there as of this time. Again, if you can help with some information, photos or other details relating to this massive yard please contact us. Finally thank you to Jeffrey for originally bringing up the topic and good luck with the layout. Hopefully it will inspire me to move my PNR layout ahead quicker. The above Google Earth shot shows the Tayuman (north) end of the yard, Tayuman Street being the main road running top to bottom of the image. With the exception of the demolished Tayuman station there isn't likely to have been any changes today. It is unknown if Tayuman station is to be rebuilt, or if all its functions are now carried out at Tutuban station (see south shot later. The numbers indicated the structures and these are outlined below. 2- Location of Tayuman station (recently demolished) and offices above. 4- Turntable pit, come green swimming pool. 5- Fuel facilities & Chargemans (Chief engineer) office. 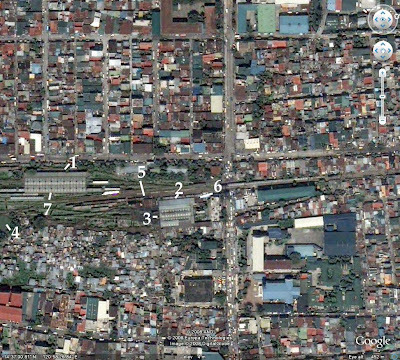 ** Also worth noting the train arriving from Alabang, crossing Tayuman Street at the time of the photograph. I must have had Jeffrey in mind when I made a last minute decision to photograph our progress through the yard in the front of a 5000 class last year.. This selection of shots taken all the way from Tayuman to the terminus approach, in conjuntion with aerial shots of the area, really help the modeler get a feel of the place. Approaching Tayuman station on our arrival back from Alabang. This station has since been demolished, presumably it and the offices above have not been replace. Confirmation of this would be much appreciated. Departing Tayuman station we pass the fuel facilities and chargemans office on our left. Nowdays an extended line of stored freight wagons exist here, although previously the point served in shunting the fuel point and gave access to other tracks that lead back to the depot. Just in view to the right is the carriage workshop. A few metres beyond the above shot, showing a better view of the carriage workshop roof. of which is to our left. The tall white tower behind them is the signalbox (tower if you prefer) and lkow and behold, a rarity in the Philippines, a colour light signal on the left hand side of the line. This is quite possibly the only coloured light signal, the only 'any' signal (other than ground type) in the Philippines today. but I have never investigated. Similarly, the use of the shed on the right is also unknown. It is however rail served and, despite flooded, is still used to stable wagons. Can't miss the PNR head quarters looming in front of us. Despite the size and modern looking buildings, the station area is in an appalling state with no facilities to shelter from the weather and rather deteriorating platforms. The dead end tracks to the left hold most of the PNR fleet of disused boxcars, while the goat in the middle of the tracks nearly became that nights dinner. Approaching the terminus at Tutuban we find only one platform in regular use. Former Bicol cars, still in good condition I might add, rest on the opposite side. Beyond this is a selection of carriages in various states of disrepair, with one still in the long superseded red, white and black livery. In upcoming parts of this series we will look at the locoshed and carriage shed structures, more shots of the yard and rollingstock, plus anything else I may have photographed there and since forgotten about. You have such wonderful articles and inspiring photos of PNR in your blog. Thanks for having such interest in the Philippine train scenario. I know the transportation industry here in the Philippines is not that advance but there are stories along with it that are worth covering, that's where i want to delve into. Thanks for your comment on my blog. I will soon post added series on my blog and i hope you visit me there. I never seen this part of PNR except for those Shanty town along the rail. Life goes on in Manila for my fellow country men.